Anyone is welcome to the event and can often use the excuse of escorting the Candidates or can be honest with their curiosity in order to see the eggs . The Candidates visiting is one of the few times that others will be welcomed onto the Sands, besides the Rider's Bet when they come to survey the future weyrlings. There is no need to bow or address Kalestath, though frequently nods of respect or recognition are given. Unruly fire lizards or Candidates face the wrath of the Candidate Master, Weyrwoman, and the potential mauling of a broody gold. Your character may touch as many eggs as the thread is open for. They may interact with other candidates, Halirina, or even O'sir. This is an opportunity for you to let your candidate focus on the sort of dragon they want and will help us create a dragon to suit. 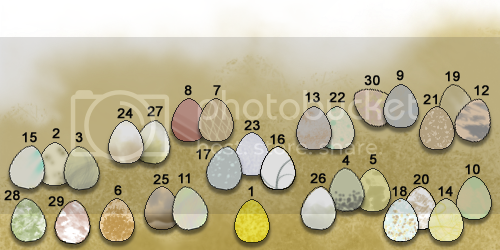 The eggs are numbered for OOC references, though you may use the visual of them to describe just which your character touches. As a note, Eggs 008, 029, and 030 are the slightly smaller ones. We understand not everyone can be on Southern Winds all the time, and so events may be missed that you simply cannot participate in. Multiple missed events and a lack of posting on the forum in general will deem your account inactive, and your characters handled as such ( a month is considered inactive ). Otherwise, if you're too busy to create an RP thread for the event, which is certainly fine, just let us know by posting here.